This pie couldn’t be easier! For the crust you just press and bake. No rolling or shaping needed. And the filling comes together in less than 10 minutes. This chocolate pie was delicious. I brought it to Sunday dinner at my sister-in-law’s house and it was loved by all. For the crust: Preheat oven to 350. In a large bowl combine the almond flour, salt, and coconut. Combine the coconut oil, agave and vanilla in another bowl. Stir the wet ingredients into the dry and combine thoroughly. Press the dough into a 9 1/2 inch pie pan. Bake for 7-12 minutes until golden. Cool completely before filling. For the filling: Reserve 1/4 cup of the coconut milk. In a medium saucepan, bring the remaining coconut milk and salt to a boil; whisk constantly for 1 minute, then decrease to a simmer. 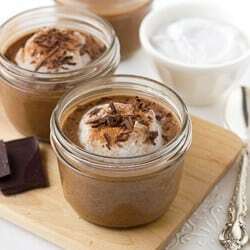 In a small bowl, dissolve the arrowroot powder in the reserved coconut milk, stirring to make a paste. Raise the heat under the saucepan to high and add the arrowroot mixture, whisking constantly until the mixture thickens, about 1 minute. Stir in the agave and vanilla. Remove from heat and allow to cool for 5 minutes. Add the chocolate to the warm mixture and stir until the chocolate is completely melted. Pour the mixture into the crust. Place in the refrigerator for at least 1 hour to set, then serve. Enjoy! I just made this tonight. 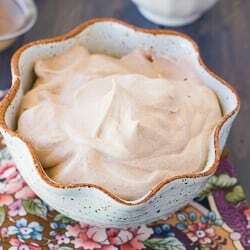 I have been vegan for several months and was craving a creamy dessert that was not too complicated. This fit the bill. It was delicious. I did use cornstarch in equal amounts of the arrowroot because it was handy, and also because I don’t always have the best luck with arrowroot. Definitely a keeper! 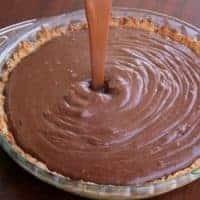 The bomb-diggity chocolate pie! For the chocolate you use unsweetened or a semi sweet? I’m new to cooking GF. I just made this to take to a bible study group. It was delicious! My mom even said it’s the best chocolate pie she’s ever had (and she is a dessert lover)! It’s not overly sweet and the crust reminds me of Somoan Girl Scout cookies! I swapped maple syrup for the honey as we are on the low-FODMAP diet. Great recipe. Thank you. I was thinking about swapping out Maple Syrup. Did you use less or still a half cup? Also did you use unsweetened dark choc or semi sweet. I am trying to reduce the sugar where I can. 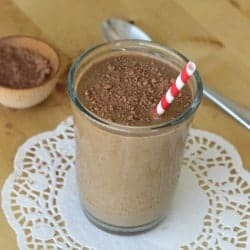 Is is possible to substitute the chopped dark chocolate with cacao powder or would this not be stable?